I’m so excited to share everything I learned during my weekend at the American Academy of Dermatology (AAD) Conference in San Diego last month. 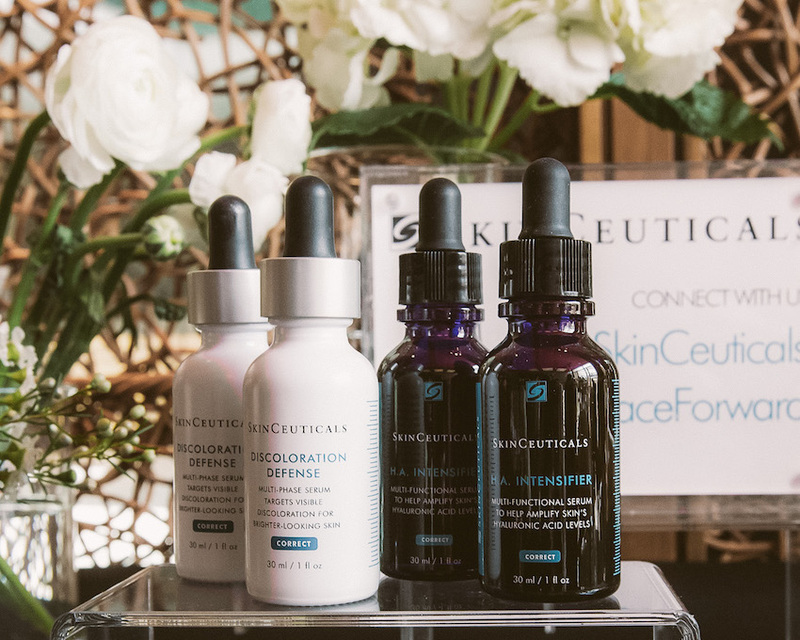 I attended the weekend conference as a guest of SkinCeuticals, the leader in advanced skincare technology and a brand that has long been one of my personal favorites. For those who aren’t familiar with SkinCeuticals, here’s why I particularly love their products: they are formulated with cosmeceutical-grade active ingredients and designed to help improve and protect overall skin health, while targeting specific skin conditions, like acne, skin discoloration. 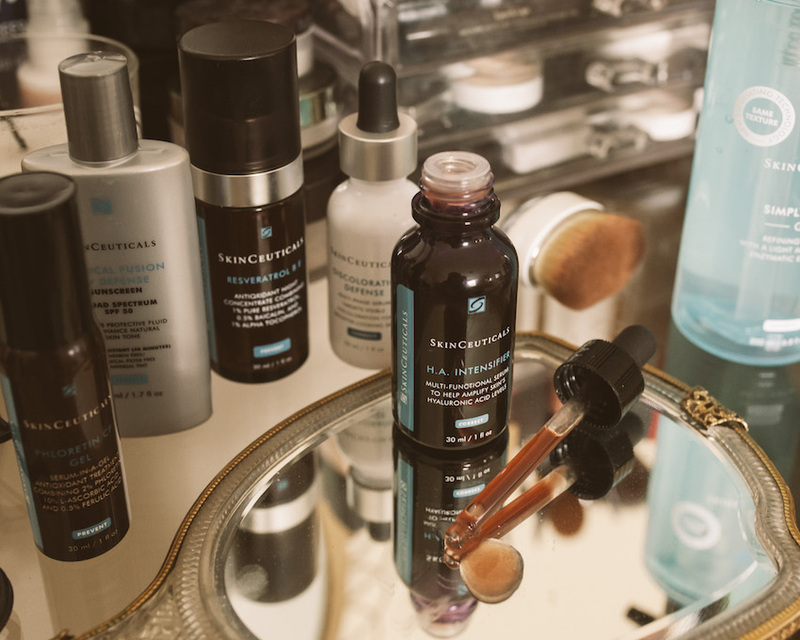 Each of their final products go through extensive clinical testing to prove efficacy on their claims, which is why SkinCeuticals is the leading cosmeceuticals brand recommended by dermatologists, plastic surgeons and medi-spas. 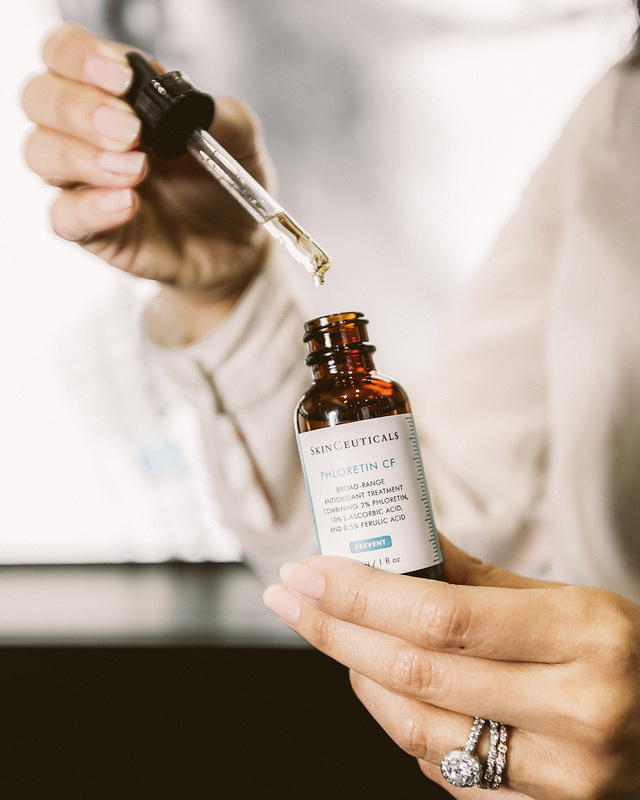 I first became familiar with SkinCeuticals when I worked as an office manager at a dermatology office in Berkeley, CA and I saw our patients walk away with a SkinCeuticals product regimen every day and they loved it. The dermatologist gave me Phloretin CF and Sheer Physical UV Defense SPF 50 when I was just a 21 year old with oily, acne-prone skin and I still use these products to this day, along with a few other SkinCeuticals I’ve picked up along the way. At the AAD Conference, I was given the opportunity to speak with Dr. William Kwan, who is a renowned dermatologist and leading expert in the treatment of ethnic skin. Dr. Kwan’s San Francisco-based practice, Kwan Dermatology, will become the 50th SkinCeuticals Advanced Clinical Spa destination in the U.S., where patients can expect an integrated SkinCeuticals skincare program combined with state-of-the-art in-office procedures to achieve the best possible results and to maximize long-term skin health - SkinCeuticals partners with dermatologists all over the country and you can find one that is located in your area here. After receiving an in-office treatment, each patient leaves with a personalized, comprehensive at-home regimen that works synergistically with the professional treatment to ensure the best results. 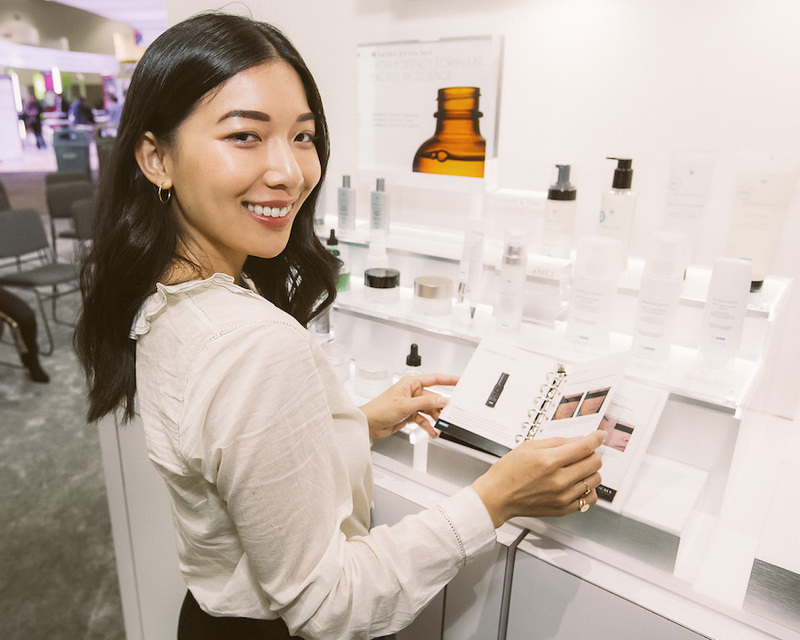 These partnerships are the continuation of the brand’s strategy to merge ultramodern in-office procedures with their scientifically-backed skincare for the best of overall skin health. Dr. Kwan educates each patient on the importance of protecting skin and, along with specific medical procedures, he recommends that each skincare regimen should include an antioxidant and SPF to keep skin healthy after leaving the office. As an expert on the treatment of ethnic skin, what is your experience in the unique needs of ethnic skin? 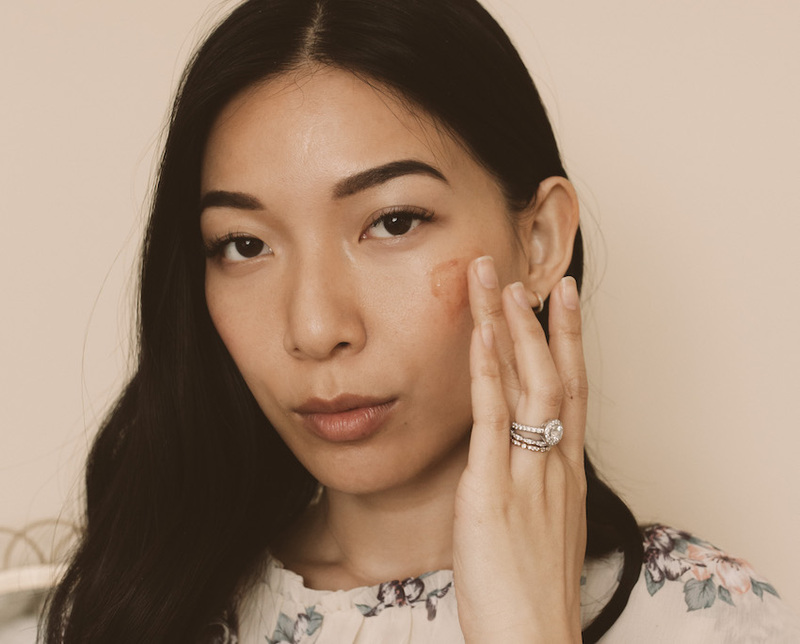 The top concerns for ethnic skin are stubborn brown patches and discoloration (the difference being that stubborn brown patches are caused by internal changes such as hormones and discoloration is caused by external stressors like sun exposure). Darker skin tones (any tone from light tan to dark brown or black) are particularly susceptible to developing brown skin spots. With ethnic skin, you have to be careful and go to a practitioner with experience to treat your specific skin type appropriately, to avoid discoloration from products that can be too harsh or particular in-office treatments like lasers that may be too intensive for your skin type. What would be your recommended regimen to lessen the appearance of stubborn brown patches and discoloration? My number one recommendation would be to diligently use sunscreen daily. Kojic acid is a great ingredient to even skin tone, which is actually a main active ingredient in the new SkinCeuticals Discoloration Defense. Antioxidants like Vitamin C help to brighten, so Phloretin CF is recommended. Phloretin CF is suitable for normal to oily skin, while C E Ferulic is suitable for normal to dry skin because of its Vitamin E, which adds more nourishment to dry skin. Resveratrol B E is great for combination skin and recommended as the antioxidant for the nighttime regimen. Paired with in-office treatments, I’d recommend light chemical peels using glycolic acid - multiple gentle treatments are better for Asian and Hispanic patients. Hydrafacials are soothing and can be made active by adding glycolic acid for acne-prone skin. A non-ablative laser treatment is a low-level laser that is superficial and requires minimal downtime and it is my go-to treatment for my ethnic patients. It has minimal risk of causing discoloration because it is so gentle, but it really helps reduce stubborn brown patches and signs of aging. Lifestyle will also be part of the discussion that may involve certain lifestyle changes to limit sun exposure, indoor tanning, etc. If a patient’s skin is in a great place, what would you recommend for maintenance? Light chemical peels at home or gentle scrubs, hydrating sheet masks that include hyaluronic acid or botanical brighteners. Keeping skin fresh shouldn’t require too many products or treatments in excess. Stick with a gentle cleanser and a gentle toner, even a natural one mixing witch hazel and water that mimics skin’s natural pH, an antioxidant morning and night, and SPF. I strive to get my patients to the point where they feel they can leave the house with just a little tinted moisturizer with a great skin canvas. How about for acne and eczema? For patients that have both acne and irritated skin, you have to be very careful in balancing treatments and products that are gentle enough to not irritate and yet still be effective in combating acne. For this I would recommend a gentle cleanser, a clay masque, and avoid topical steroids that could inflame eczema. Oral medications can be discussed. Gentle facials like light peels and manual extractions would be great for skin with both acne and irritated skin. We look at topical maintenance and lifestyle, everything you’re doing. Data suggests nonfat dairy and high sugar diets (including fruits and refined carbs like bread, pasta) contribute to acne, so we try to adjust that diet if that’s the case. After learning so much from Dr. Kwan, I went home and adjusted my skincare routine last month to include an antioxidant at least once a day, hyaluronic acid, and SPF every morning. My skin is acne-prone, dry, and sensitive, so I try to stick to the gentler side of products and treatments. During the day, I’ve been using SkinCeuticals Purifying Cleanser, 2-3 drops of Phloretin CF, a gentle natural lotion if needed, and Physical Fusion UV Defense SPF 50. At night, I wash with the Purifying Cleanser and on clean skin, I press 1-2 pumps of Resveratrol B E and finish with 4 drops of H.A. Intensifier. Every other day or so, I dab in a drop of Discoloration Defense on any dark spots I have like acne scars and scars on my legs from bruising and scrapes. I’ve already noticed a difference after a month! SkinCeuticals products feel amazing and appear noticeably effective; my skin is glowing, my brown spots are lighter, and I do feel that my skin is more protected. I’ve also done laser treatments in the past similar to the one Dr. Kwan described above and it’s dramatically helped improve my overall skin texture and tone, but I’m looking forward to trying an in-office non-ablative laser treatment and Hydrafacials in the dermatologist’s office for my acne. If you’re in San Francisco, I highly recommend visiting Dr. William Kwan’s Kwan Dermatology for your skin health because he’s so knowledgeable and experienced with ethnic skin and very friendly and easy to learn from. The next time I’m visiting SF, even for just a short couple of days, I’m making an appointment! We have the same skin type, yay. I’ll take your tips. Thanks for sharing Steph. I also have an acne-prone, dry and sensitive skin like yours, i’ve always battled with cystic acne and everytime i use acne products to treat ir, it dries my skin out like crazy. Btw, your post is really insightful and the pictures are amazing. I hope i can win these products ! This is so helpful Steph - thank you! I’ve recently been breaking out a little and it’s definitely the high sugar content from eating too much smoothie bowls lately (not enough greens). But am always so happy to see your skincare posts - Your skin always looks so glowy and radiant! I’ve been using the Ren Wake Wonderful thanks to you and it’s so nourishing for this winter season. Thanks for the tips - Fingers crossed! I’ve been wanting to try this brand forever now!! Thank you for such a thorough and informative review of their star products. I’ll definitely want to start my foray into Skinceuticals with the Phloretin CF and HA Intensifier. FIrst time I heard about this brand. THank you sharing this information. Thank you so much for you attention to detail when writing about the treatments. I have huge acne scars and blemishes on my face and would love to try and see if this would help out. Hi Stephanie, huge fan and love this post! Delighted to be from SF, I’ll definitely be booking an appintment with Dr. William Kwan! Really want to try this brand! My skincare routine can definitely use some fine tuning! ✨ Thank you for sharing this post! I’ve been struggling with breakouts every now and then! Would really love to try this product as they are not yet available in Indonesia! I’ve been wanting to try this line of products! Hopefully my skin can look like yours one day!! Love your tips about beauty and skincare! I feel much confindent when my skin is beautiful without having To hide it with makeup. Would Love To have these products to pamper my skin. Your skin is a dream! Thanks for this very informative post. Love your instagram and great post :) !! Been struggling with adult acne for some time now and will have to check out those products! Ooh really appreciate the specificity for ethnic skincare!! Wonderful advice, especially for the hyper pigmentation. I appreciate your holistic approach to beauty too. I wish I could try these products!! I’m sooo stressed with acne scars that I am prompted to use makeup everyday even though I hate it! I’m so glad I found you on @songofstyle Instagram! Am struggling to find the right skin routine and I stumbled on your page through songofstyle! Love all the posts so far, the aesthetics are very pleasing. Discolourations are pain ;( I would love to try out these products! Thanks Stephanie!! hello :) thank you for the blog post and doing this skinceuticals giveaway. been meaning to try out this brand when my budget allows, as I also have sensitive and acne-prone Asian skin, and would love to win. but besides that, love your aesthetic and you've gotten a new follower. Such an important post! It's hard to come by advice/product reviews specifically for us with ethnic skin! It was so lovely meeting you and your husband Thursday at Sezane!! It was lovely meeting you and your husband Thursday night at Sezane!! I am loving the bag. This post is great as I’ve been dealing with sensitive skin since moving. I‘m a very sensitive skin person. I hope I can win this product and try it! Really love this post!! So detailed! I’ve heard so many great things about Skinceuticals and would love to try their products someday! I would love to try this brand! So your posts have changed my attitude about skincare and I’m kinda obsessed. Thank you for making this information so accessible and thorough! From an eager twenty year old entering the skincare world. My skin has been my biggest insecurity for the longest time so I’ve been searching for new ways to improve it. Great post, thanks so much for this Stephanie!! Oh I would live to try it, my Skin is sooo sensitive..
Love skinceuticals, my mom has recently started using their products so I'm dying to try. love that this post included to my skin type (acne prone, oily, ethnic). Thanks for sharing! Hey Steph! Thanks for the informative post! Thanks for your honesty and hard work! I’m so glad I found you @songofstyle Instagram! You have become one of my favorite blogs since then! This post was so informative! Thank you so much for sharing! I have been dying to try skinceuticals for so long now! You always have the most beautiful glowing skin! I’d love to try these out as my skincare routine needs a major revamp!! I am in LOVE with your skin. I am a college student going through some serious hormonal acne right now and although I know I should invest in great skincare, i have tried everything my bank account will allow and none of it has worked for me. I would love to give my skin a chance with this treatment as well as my self confidence because bad skin really does take a toll on my day to day life. I’ve been experiencing issues with dark spots on my cheeks as well and have been looking around for a solution to brighten my skin. I’ve noticed that tour skin had this natural glow and I’ve been curious to know how you got to. Glad I chanced upon your IG story which led me to this helpful article. Would be really grateful if I could give SkinCeuticals a try and improve my skincare regimen. Thanks for sharing your experience, Steph! I love your blog and instagram! These products seem amazing! I feel like hyperpigmentation is always something I am battling woth. Thank you for such an informative post! You have such a glow, and it's great to learn about the products in your routine. I wish I had known about Dr. Kwan when I used to live in SF, but will definitely try to make an appointment the next time we visit. Thanks! I have some discoloration problems with my skin and nothing really has made any difference, would love to try out SkinCeuticals. The cold winter weather is not doing any good to my skin either always trying to add new hydrating products to my skincare, this post is super helpful! I have these dark spots that just won’t go away ! Would love to give the set a go to see if it will get rid of them ! My skin has gone crazy ever since moving, and I’ve always been interested in trying Skinceuticals products. This may be just the convincing I need. Thanks for sharing everything you learned! Thanks for sharing about SkinCeuticals! Stubborn brown patches are a constant struggle for me, I would love to test what SkinCeuticals can do. Wow, that's crazy! I didn't know my ethnic skin needed to be treated differently than other races! I’ve been wanting to try this brand and move on from drugstore purchases that I’ve been lucky enough to have worked for me for my entire life. But your skin changes as you get older and drugstore brands miss the mark. Thank you so much for the thorough interview! It only peaked my curiosity even further!